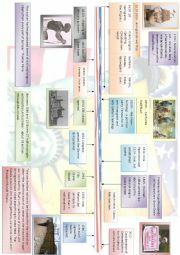 Here is a timeline of American immigration. I couldn´t find one that fit my needs so I made one! I hope it will be useful for you too! 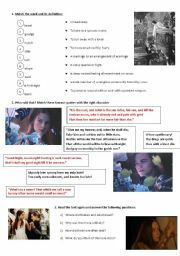 This 2nd part is composed of a vocabulary exercise, a recognize the quote exercise and a few reading comprehension questions as well as a discussion topic. I´m very sorry I couldn´t fit the 2 pages into one file. It was impossible to stick to 300Ko. I hope you´ll enjoy it! The correction can be downloaded separately. Here is the correction of the 2 parts; for this teacher´s WS,I had to remove a few photos to stick to the 300KO allowed . 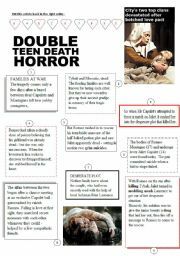 I thought it would be a great way to make students learn about Shakespeare.Hope you´ll like it. 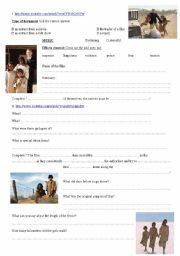 While watching the trailer and an excerpt from a documentary of the movie "The rabbit proof fence", the students will complete and learn about the fence and the stolen generation. Correction included. 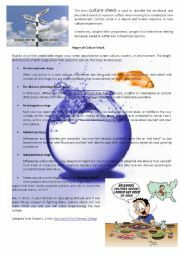 My previous worksheet was reported because I had used a cartoon so here it is again. i hope it is OK this time. I really believe this listening can be useful so... 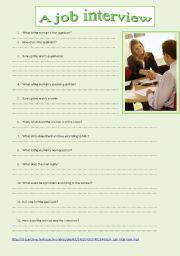 Your students will be able to work on questions and answers during an interview. I had time to include the key this time as well! Hope you like it! 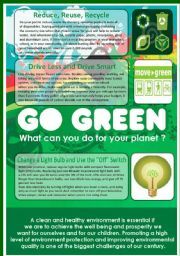 The poster deals with actions you can take for the environment. The questions are composed of vocabulary, true or false, find elements in the text and use them to make suggestions. Hope you like it. Spin the wheel of grammar! Click to spin the wheels: the first one gives you a subject, the second one elements to choose between presents, the third one the form (+ /- ) a verb appears to complete this sentence!. About 30 different sentences. I hope you find it useful. It is editable of course according to your needs. Based on two different cartoons, you can work on computer addiction thanks to this powerpoint. I included a page of information to make it work well. Hope you like it! A cheeky child! I still love ya! Based on a drawing, part of a unit "Forgive, Forget", I made this powerpoint to describe and work on different structures and link words. You can speak about punishment, parents and child relationship... I included a page of information to make it work well. Hope you like it!